As we know, with the development of the Centennial Campus, the University is investing heavily in it’s infrastructure to ensure that it is ready for the double cohort of students that will be arriving in September. This increase in student numbers is as a result of structural changes to Curriculum delivery in Hong Kong, and in addition to the new campus and facilities, there is also a great deal of activity to prepare for September 2012 elsewhere on the campus. Once the three Faculties of Law, Arts and Social Sciences move to the new Centennial Campus, work will get underway to refurbish and repurpose the vacated space in order to improve facilities for most of the remaining 7 Faculties. Included in this programme is work to improve student learning facilities in the Main Library. For a number of years the Library staff have been exploring ideas and ways that they can manage the University collections whilst releasing space to other much needed student activities. Students require much more dynamic, technology rich spaces in which to study in addition to the quiet, reflective spaces to be traditionally found in libraries. 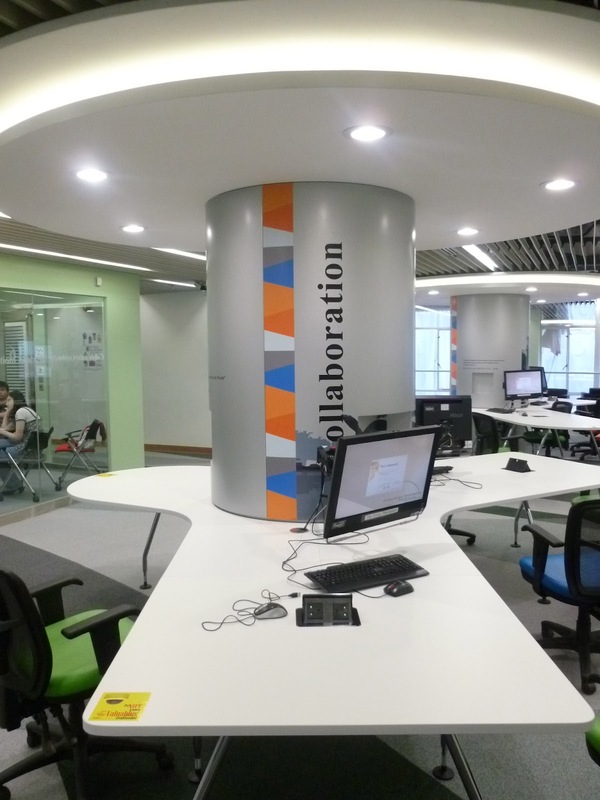 In September 2011, staff from the HKU Library attended the Universitas 21 Learning Environment Design Workshop hosted by the University of Birmingham, and although plans for a new “Learning Commons Style” facility were well underway, the participants felt that the experience of the workshop has helped to inform the development of the space. Recently completed, the 3rd floor of the library has been entirely converted to accommodate the Learning Commons. The space has been configured into a number of zones, clearly definable by the use of colour, lighting, furniture and facilities. The space is divided across two wings with a central core housing staircases, lifts, toilets etc. As soon as you arrive at the third floor either by the lift or the staircase, the identity of the space is clear. Zones A and B are located in the smaller of the two wings and are separated from the rest of the accommodation by the lift lobby/stairwell. This separation works well, as the other Zones in the facility are not delineated by physical barriers. The partitions of the carrels vary in height, some that enable students to look around and see others working in the space, and some at a height to give a degree of privacy. 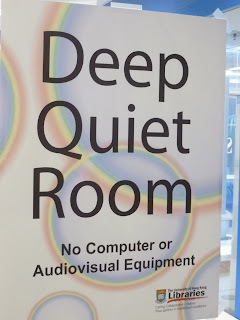 This is a space where absolute quiet is expected, students cannot use their personal computers or devices in this space. Although it was quite early when I visited, already a number of students were working in the space. 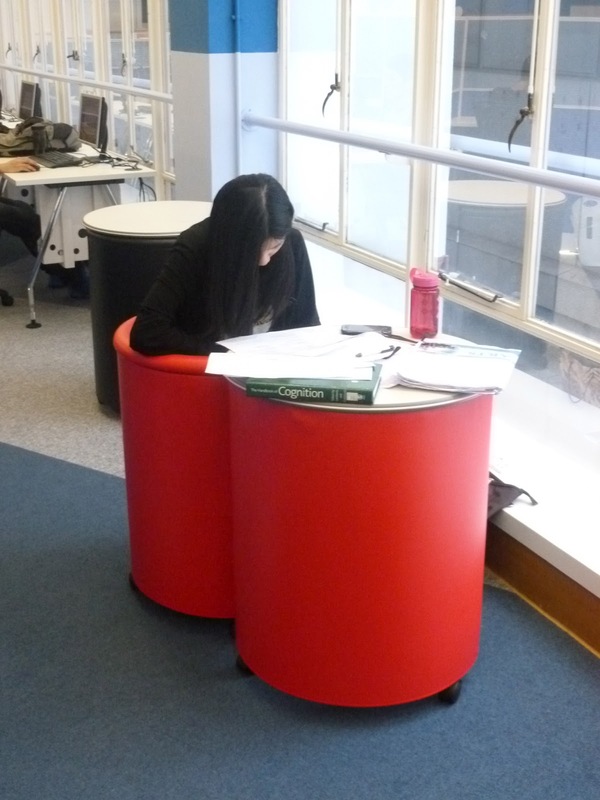 For students who wanted an individual working space in a quiet corner, there are some innovative and funky “all in one” tables and chairs. Comfortable and mobile, but with quite a small footprint. These look like some sort of containers..
Unit opens showing seat and space for bags etc. A few computers are also located here. 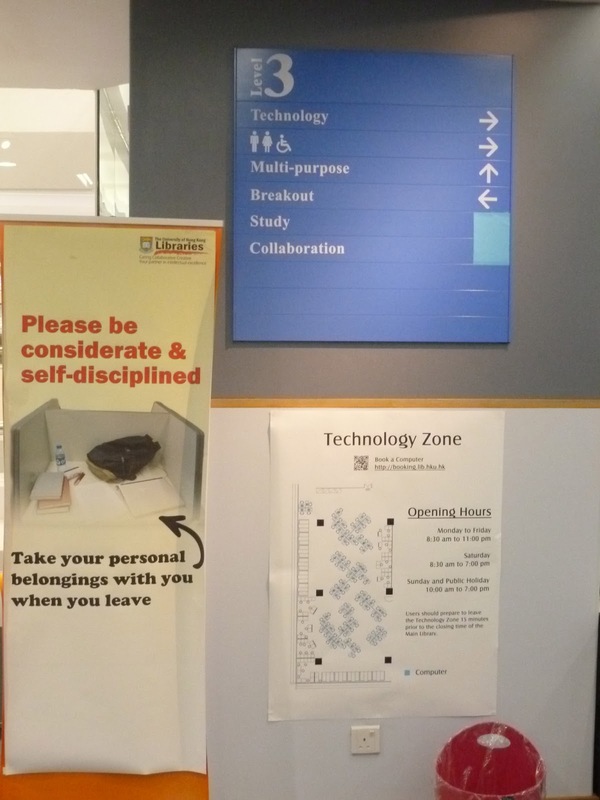 Leading directly off the Quiet Zone, is Zone B the Group Discussion Zone, and you would think that these were two activities that could not be easily co-located. However, the Group Discussion Zone includes 17 Group study rooms, some of which are located around the periphery of a main open area. These rooms are sound proof, and suite of 6 rooms have been located by the Quiet Zone to form a neat barrier between the Quiet Zone and the noisier open areas. Most of the Group Study/collaboration Rooms were in use with students mainly preparing for presentations to be assessed as part of the examination process. Many of the students were wearing business suits, something that I have seen a number of times over the past few weeks. Four of these rooms have partition walls and can be converted into two larger rooms if required. Staff or students can book any of the rooms, and if the larger rooms are required, the Library staff will arrange to open the partitions in advance. All of the rooms have a wide range of equipment installed complete with laptop computers, however if the students want to use their own devices, they can easily connect into the system. The tables are adapted to house access to power and controls for the equipment etc. and, equipment use instructions are also located here. The main area of this zone is given over to informal group working space with large tables to accommodate reasonable sized groups, their books and laptops etc. As is often the way, large columns exist in the spaces, but these have been cleverly utilized to create some separation between the groups, deliver access to power, provide good lighting and some decoration. 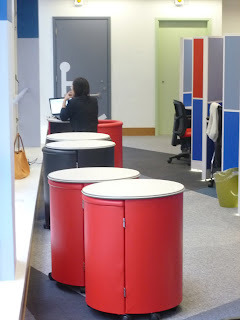 Other corners of the space have been used to create informal discussion areas. The other Zones are located cross the Lift Lobby and Stairwell and I am going to talk about each of them as we meet them, which will take the zoning letters out of sequence!! This is a very small, but extremely important zone. 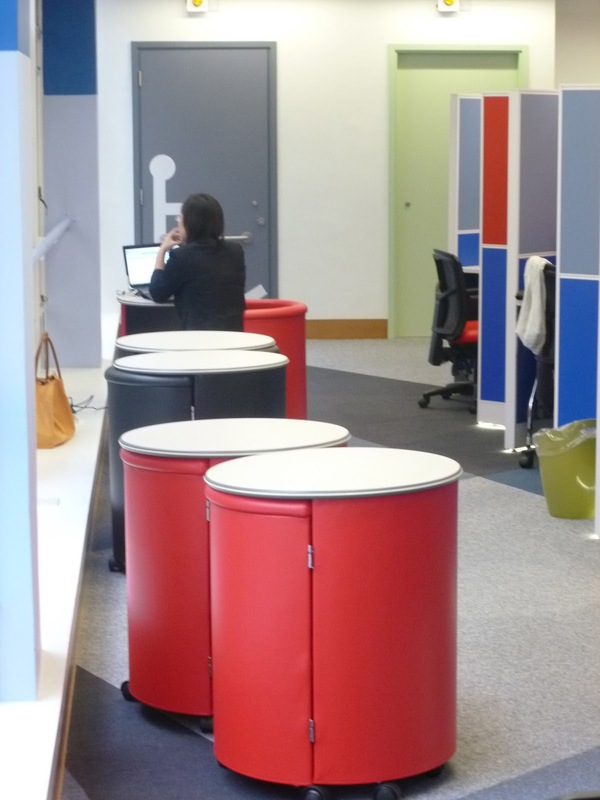 As soon as you enter the floor, you are greeted by the enquiry desk, staff here can help with just about any question that the students may have and they are also able to provide support to most of the technologies deployed on the 3rd floor. Immediately on entering this space, the lighting system used creates a very different feel and environment to spaces elsewhere in the library, the lighting seemed to be good everywhere and no sign of “pooling” or dark /gloomy areas. This area is the open access computer cluster area, with a large number of fixed PC’s and scanners which are bookable through a booking system. 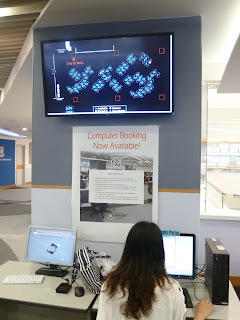 Students can book using the workstation in the room or online from wherever they are located. which is now known as the “Multi-purpose zone". This is an area with much more flexibility than other spaces on the floor. The tables and chairs are on wheels and the students can rearrange them and bring together more tables to accommodate larger group. This is also a space that can be separated from the technology and other zones to accommodate other activities and events. 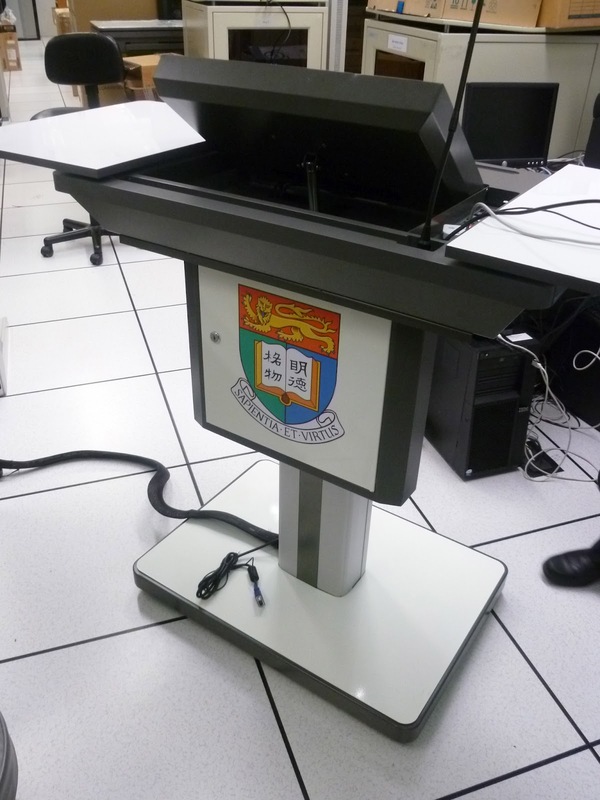 There is also a lectern that can be brought into the space when required. Between this and the next Zone, (Zone C, Socialisation and Relaxation) there is a narrow corridor connecting the spaces. In this picture (below) we can clearly see the double height atrium space breaking up the floor plate. This atrium is glazed and not only prevents sounds spilling between the two floors, but also assists with sound control on the 3rd floor generally. Zone C – Socialization and Relaxation Zone. The final zone on the 3rd floor is set up for informal meeting and working, and includes a corner with vending machines for cold drinks and snacks. Throughout the 3rd floor, the carpet and marmoleum flooring is used to create pathways and delineate spaces generally. In this area, the floor shows students quite clearly where the boundary for food and drink exists. Red strips on the floor, "no food or drink past this point"
In addition to the bar height working areas with stools, this space is broken up by a number of alcoves with a range of soft furnishing. This is the last area to be completed in the learning commons. The final delivery of furniture was expected at some point during the day, and when word reached us that some of the the new sofas in the style of "Ying and Yang" had arrived, we rushed to see them, but we were beaten to it! This brings us full circle around the space in view of the enquiry desk. Considering this is just one reasonable sized floor (I am not sure of the actual number of square metres) in a University Library, there is a huge amount to see and to note. The space allocation for each zone has been carefully considered and all of the elements including environmental, technical and physical (furniture etc.) work wonderfully together to create a fantastic space for the students to work and learn in. This "all in one" seating must be comfortable for the chinise prototype woman....if I sit in one of those I am not sure I would be able to get out again....ja,ja,ja! Hi Maria, I have a picture with me sitting in one, and I didn't get stuck!! Very interesting indeed Toni. There are some good ideas here, with way finding and graphics, and all it seems very clear and well organised for students. Did you get a feel for what students' preferences were for certain places? Was there a buzz anywhere? 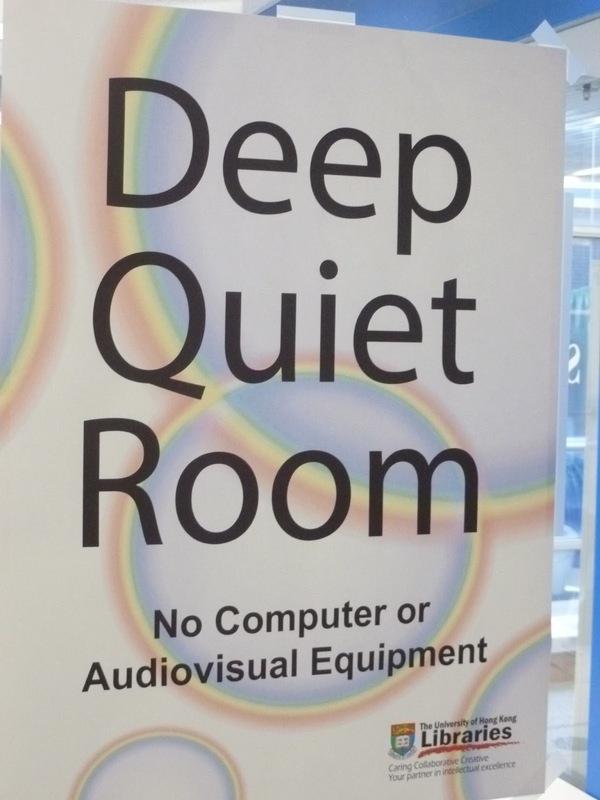 Not sure about the call centre style of the quiet zone but you can see that they're offering distraction proof carrels and a bit of colour to jazz the screens up. Quite corporate but maybe thats for student acculturation? Hi James, The place were there was a real "buzz" was the collaborative zone, lots of activity both within the group study rooms and in the open area. Elsewhere, there was a general "hubbub", but at a very low level, I have been struck for the last 3 weeks at how quiet students have been in their libraries. All of the spaces around the periphery were well used because of the access to power. 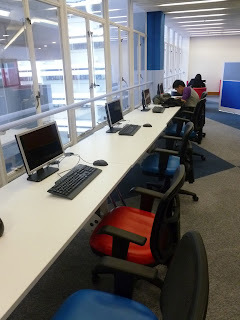 Elsewhere in the library, we came across students studying in more traditional and quiet library spaces with cables for laptops stretching to every available power point which more often than not was not conveniently located. Maybe it's my poor camera skills, certainly within the spaces they feel light and vibrant, I guess the study carrels might be the least "exciting" but there is no question that these are spaces the students want to inhabit. Cool place with lots of good equipments there! 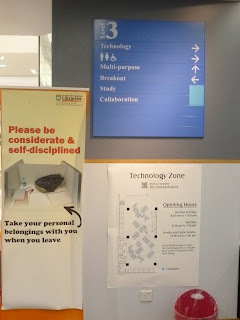 no wonder HKU ranking a pretty high position in the whole world. i have to say i am a little bit jealous.. anyway, good report! Thanks for your great information, the contents are quiet interesting. I will be waiting for your next post because you always help to the student i like it . Thank for sharing great information.